Bonifacio Aleman or as many call him, Flaco, is from Milwaukee, Wisconsin and grew up in a single parent household where he recalls that crime and domestic violence were common. Flaco also recalls that most everyone in his family has been to jail. Since he went to prison before he graduated from Jefferson County High School he ended up earning his GED in prison and also while in prison, started college. He spent 11 years in prison for armed robbery and kidnapping. Flaco feels that with a better lawyer or the means to pay for a better lawyer his final charges would have been different. Since his time home, he now serves as the Executive Director at Kentucky Jobs with Justice and volunteers within the social justice field serving as a board member for Fairness Campaign, Hispanic Latino Coalition of Louisville and Sowers of Justice. Mark Romines is a Louisville, Kentucky native. He has been happily married for 32 years and has a son, 2 daughters, and 2 grandchildren. 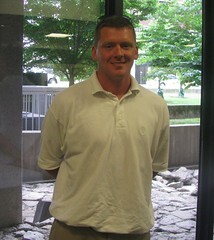 Mark has been a member of the Volunteers in Police Services program for 7 years. He is a volunteer usher at the University of Louisville basketball and football games and a member of his local homeowners’ association. Mark is also active with KFTC’s Coal Ash campaign. Mark is a carpenter by trade and served in the military. In his spare time he enjoys watching college sports and riding his motorcycle and ATV. Mark lost his right to vote in Kentucky almost 40 years ago after being convicted on a drug charge in Nebraska. At the time he was not aware that he was considered a felon. “I was placed on probation and didn’t spend any time in jail.” It wasn’t until he received a call from the ATF more than 20 years later asking that he surrender a hunting rifle he had recently purchased that Mark found out he was a former felon. But what he can't do is vote. Though he's telling his story to help change that. "I’m politically active," says Rev. Ron Barrow of Lincoln County. "I read newspapers and pay a lot of attention to what’s going on nationally and locally and it’s frustrating not to be able to participate by voting. "I know a lot of people who can vote, of course, and I guilt them into getting out and casting their ballots – because it’s the right thing to do and because I can’t. We had a pretty good voter turnout in Lincoln County this past year, which I’m kind’ve proud of. "I'm a former felon," Says Sandy Holbert of Scott County," …but that's not all I am. 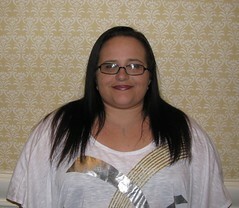 I'm a mother of four, daughter, a sister, a Sunday school teacher, a social worker and so much more." Like 243,000 others in Kentucky, Holbert can’t vote because of something she did wrong in her past, paired with Kentucky’s extreme felony disenfranchisement laws. Only Kentucky and Virginia take away voting rights from all former felons unless they can get a partial pardon from the Governor. When I received notification that I could no longer vote... I opened it up and the shame and embarrassment flooded me. Even though I was the only one home I the time, I went to my room and shut the door and cried... I felt like someone had just stripped me of my voice." A couple of weeks ago, Jason Smith, 32, from Elizabethtown succeeded in regaining the right to vote and plans on voting for the first time in the election this November. But it wasn't an easy path getting there, he told us. "I haven't always been a minister, you know. At one point, I was a gang member and a drug dealer. 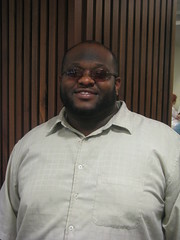 I ended up getting arrested in 2003 and again in 2004 when I was sentenced to 12 years for drug trafficking." "It was a little after that that I realized that the lord was calling on me to preach. I really changed my life around. I did a lot of preaching in the penitentiary and it really felt like the right thing to be doing." 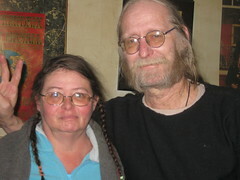 "I've lived a lot of places in my life," says KFTC member and new former felon spokesperson Jim Shepherd. "All over the U.S., really; but my family is from Hazard, I've lived here for the last five years, and I'm planning on staying." 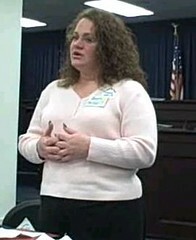 Katrina Byrnes is a life-long resident of Louisville, a mother of four, and is very involved in her community through the Kentucky Alliance Against Racist and Political Repression and other community organizations. 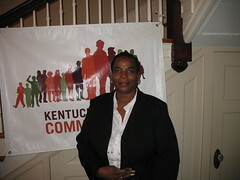 Tayna Fogle is a mother of 2, grandmother of 6, former UK Lady Kat, powerful leader in her community, former felon, and one of KFTC’s most powerful spokespeople on the issue of restoring voting rights to former felons who have served their debt to society. We've found that the stories of individual people with felonies in their past can go a long way to connecting with people throughout our Commonwealth, so we've collected this series of interviews over the years. Kentucky's 312,000 citizens impacted by our regressive felony disenfranchisement laws include people from your community, people you know, and people you can relate to.